Mercedes will aim teh A class at younger buyers in China. SHANGHAI -- Mercedes-Benz will sell its A-class hatchback in China at prices ranging from 238,000 yuan ($35,800) for the three-door A160 to 278,000 yuan for the A180 five-door hatchback. Bjorn Hauber, executive vice president for sales for Mercedes-Benz China, said the A class is aimed at younger consumers, the Shanghai Daily reported. In the first nine months of 2010, the German luxury carmaker sold 101,300 cars, up nearly 130 percent from a year earlier. 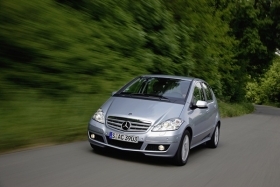 Mercedes has already exceeded its 2010 sales target of 100,000 units and now aims to sell 120,000 cars for the full year. Daimler AG aims to triple sales of its Mercedes, Smart and Maybach brands in China by 2015.